(OPride) – Bekele Nadhi, a prominent lawyer and fierce Oromo rights activist, who was among the pioneer founders of the Macha Tulama Association (MTA) passed away at his home in Addis Ababa, Ethiopia on Tuesday from heart complications. He was 80. Over the last 50 years, since the founding of the MTA until his death, Bekele served in various leadership capacities, including as a president, vice president, honorary president and most recently legal advisor, according to statements from the organization. The MTA was formed in 1964 as a grassroots-based pan-Oromo organization to promote socio-economic development across Oromia, the Oromo country, and to emancipate the Oromo from cultural marginalization, political oppression, and economic exploitation. The Oromo are Ethiopia’s single largest ethno-national group. A watershed event in Oromo history, the creation of the MTA allowed Oromo activists to mobilize their resources and unite disparate resistance movements against feudal oppression. Its founders played a monumental role in the Oromo reawakening, not least through the publication of a fervently revolutionary literature. The organization attracted Oromo luminaries, including martyrs Mamo Mazamir and Baro Tumsa as well as former Oromo Liberation Front leaders such as Lencho Lata, Ibsa Gutama and Taha Abdi. But it was during the organization’s turbulent episodes that Bekele’s able leadership and dedication was felt the most. The MTA was repeatedly banned under three successive Ethiopian regimes. Time and again, Bekele played the role of a savior, courageously steering the organization out of the stormy seas. He was the steady hand that manned the ship in its greatest hour of need. In 1967, when the then Haile Selassie regime arrested its core leadership and banned the MTA at the peak of the organization’s ascendancy, the defiant Bekele clandestinely organized activists to ensure continuity. He was later elected vice president when the organization’s founding father and longest serving president Colonel Alemu Qixessaa was released from prison. In early 2000s, upon the Colonel’s passing, Bekele led the organization as its interim president for a period of one year. He subsequently stepped down and passed on the torch to Dr. Gemechu Megersa. Shortly there after, the organization was embroiled in a rare spate of internal disputes, once again requiring Bekele’s seasoned intervention, ending with an early election. In 2004, Ethiopia’s ruling party, the EPRDF, once again arrested Dr. Gemechu’s successor, Diribi Demissie along with other senior leadership for alleged ‘political’ activities. The banning of the organization followed suit, the last nail in the coffin of independent Oromo civic and open activism. The octogenarian Bekele would not relent, even at an advanced age. He offered his place of business for board meeting and relentlessly campaigned for the release of its leaders and the reopening of the organization. Born and raised in Addis Ababa, the cosmopolitan Bekele was also remarkable in many other respects. Decade after decade, how he led his life and carried himself around served as a relentless reminder of Addis Ababa’s Oromo identity – an inspiration for the Oromo and a thorn in the throat of his detractors. This has endeared him to friends and even those who disagreed with his political views. In addition to his more than a half-century of activism and leadership, Bekele often facilitated a return of the body of Oromo expats who passed away abroad, including the late Sisay Ibsa. Bekele was a father of four children, including two surviving daughters. According to Oromo elder Lube Birru, Bekele treasured Oromo culture so much so that each time he left the city he would join wedding parties uninvited to learn about traditional Oromo wedding ceremonies. 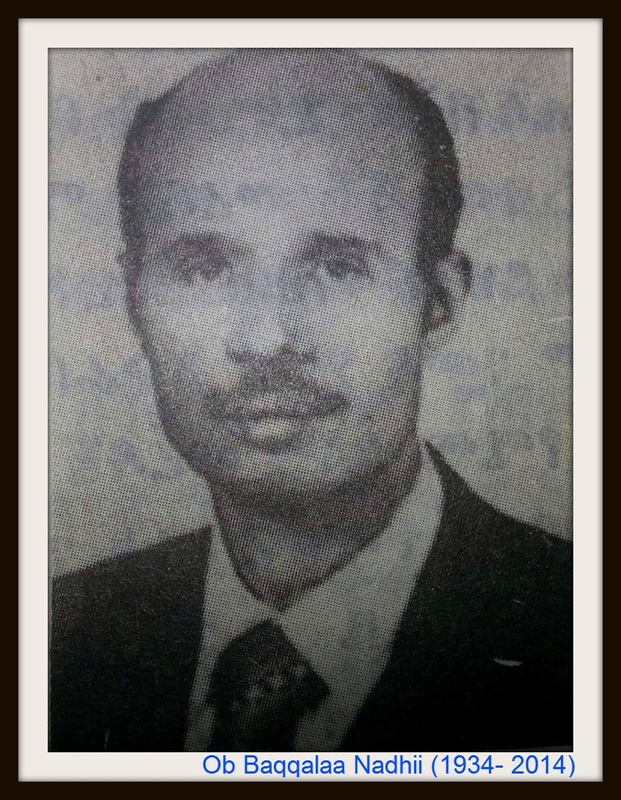 Obbo Lubee recalled one historic case from Bekele’s long legal career. It was during Haile Selassie ’srule. Bekele represented a group of 80 farmers who were evicted from their farmland in from the Arsi province. When the local court ruled against the farmers, Bekele managed to present the case beforethe emperor at the Zufan Chilot – an appeal “court” where the monarch himself gave the ruling. As the farmers exited the court, petrified, Haile Selassie asked Bekele to bring them back and reversed his decision. And they were allowed to keep their land. A memorial service will be held at the Saris Abo Church in central Addis Ababa on Feb. 13, 2014, according to the organizers. A U.S.-based nonprofit, the Macha-Tulama Cooperative and Development Association, is commemorating the 50th Anniversary of the founding of MTA on August 1, 2014 in Washington, DC. Posted on February 13, 2014, in Uncategorized. Bookmark the permalink. 2 Comments. While remembering our hero, let us also follow his footstep. I am deeply concerned with the trend of Government of Ethiopia on systematically and gradually deleting the right of Oromos on their land. I am not articulator on the legal and constitution of Ethiopia but I am hearing some information on the constitution of Ethiopia with regard to some issues. 1. Oromos/Oromiyaa has unique advantage or benefits on Finfinne. I understand TPLF cannot respect the right of people that stated on its constitution. I am not expecting any positive response from TPLF. But what deeply concerned me is that the more we keep quite on this and other issues, the more we are allowing our-self to TPLF exploitation and finally back to where we have been. It is very disturbing that we Oromos have no right to access to school for our children in their mother tongue which is the national and universal rights of children. In contrary, all minorities in Oromia have a right to access to school with their mother tongue. 2. Oromos around Finfinee are gradually evicted from their land. I have been to around Holota for some mission where land is on sale to the investors without any plan and study no matter its environmental implication is. I have managed to talk to some farmers on this issue and they are so furious and ready to die for their land. It is also a recent witness that farmers around LagaTafo are angry on grabbing of their land. These are very clear and fundamental for our survival. We have reached at stage where we cannot survive without these fundamental rights and failure to claim these rights implies we ceased to exist. It is due to our silence that made TPLF to expand them to control, sell and settle on all Oromia Towns around Finfinne. We can witness the recent Master Plan preparation to include Oromia Towns under Federal Government where our fate is not clear. Therefore I argue all my Oromo fellows and human right activist, to involve, contribute ideas, strategies, organising, the way we continue to claim our rights step by step. We have opportunities and threats as well. The frustration of our farmers is an opportunity to engage wide group of people. The vast number of oromo in that country to put pressure on the government specially during election is an opportunity for us, but we need to educate, aware, activate and organise our people on its constitutional and universal rights. Task force committee consisting of different group of society can be formed including, farmers from different locations around finfinne, students, elders, lawyers, political leaders in the country etc.. This is just my thought but can be well articulated and organised by relevant experts. We need to avoid the mentality of being freed by someone else, like waiting to be freed by WBO. To be honest Oromos can be liberated even without firing bullet if we made our self mentally free. I just remembered what Aliye Galato said about freed horse but the horse thinks it is not free. Lets us do our contribution. I understand some of our people are in jail for speaking Oromo concerns and our fate could also be the same. But how long we being in silence and whom will we expect to speak for us. We can start to pressure on OPDO even though OPDO is hand-capped. If we put good strategy, we can make social and political pressure on OPDO and member of parliaments on this matter. Any time they have been requested about school in afaan oromo in Finfinne they are saying permitting afaan oromo in finfinne is the willingness of Finfinne administration. It is shame to hear such word from oromo representing groups. I kindly request Oromo Voice Radio to imitate and invite some experts on this issue. After a victory on Boycott Bedelle, I remember some people have committed to prepare some proposal on these and others, but no one has come up with the proposal for debate. Just correction…This suggestion was initially written to Oromo Voice Radio. apology for in appropriate address.